of Tennessee volunteers near the end of the battle. 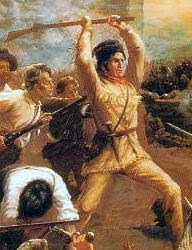 It has long been a well-known historical fact Brother Davy Crockett (1786–1836) was a patriot and hero who gave his life in defense of freedom at the Alamo in 1836. By the late 19th century, however, Crockett was largely a forgotten figure. The events leading to Texas' independence and eventual statehood were long in the past and very few remembered the names of the brave soldiers who helped bring it about. The situation changed when, in the mid-1950s, Brother Crockett transcended all that and became an American icon with the release of Walt Disney's television series about his life, as well as the movie, "Davy Crockett, King of the Wild Frontier." Since that time the series has been replayed to the point that every kid learns about Crockett's heroism at an early age. Interestingly, Crockett's rise to the level of superstar almost didn't happen. In 1946, famed artist Thomas Hart Benton (related to two famous Masons with the same name, but not a Mason himself) briefly worked for Disney, and came to him with an idea for a show. He presented Disney with an outline for a musical about Crockett's life called "Hunter From Kentucky." To be generous, Disney (who as a youth was a DeMolay) thought Benton's concept was poor and he quickly shelved the project — with the intention it would never be used. However, in 1954, the weekly TV series known today as The Wonderful World of Disney premiered. Less than a year later, the Disneyland theme park opened, TV ratings skyrocketed and Disney started a daily show, The Mickey Mouse Club. Producing a minimum of six shows per week, Disney's appetite for material became voracious. So he went back to his "dead ideas" file and there he found Benton's mercifully forgotten manuscript. Disney handed the project to his staff, which reworked the idea into something that, in reality, bore little if any resemblance to the outline from Benton. The product Disney's talented writers came up with arguably might be the most popular show ever to emerge from the Disney studios — but one thing is certain: the series almost instantly catapulted Brother Davy Crockett from obscurity to rock star status. You assume that Davy Crockett was a Mason. But, you provide no citation or evidence. How do we know that he was a Mason? Bc it was well known in West Tennessee where I'm from and they still have his masonry apron. Bc it is a well known fact in West Tennessee where I'm from. They still have his apron today... Is that proof enough? While serving in the United States House of Representatives, Crockett became a Freemason. He entrusted his masonic apron to the Weakly Lodge in Tennessee before leaving for Texas, and it still survives today. (Publication from the Grand Lodge of Texas, on Masonic Research). Do a little homework dude, before "opening mouth and removing all doubt." Davy Crockett most likely belonged to a Lodge near his home in Weakley County, Tennessee. A fire destroyed the Lodge during the Civil War and, along with it, all membership records. His Masonic apron, however, survives. Crockett left the apron with the county for safekeeping prior to his trip to Texas. Its provenance is excellent and confirms his membership. The Grand Lodge of Texas recognizes Crockett as a Freemason and recognizes him, along with Travis, Bowie and others on the Masonic wall of honor at the Alamo. I'm from Weakley and Carroll counties in Tennessee. Still to this day, Davy Crockett's story is well told. He lived in a area called Home of the white squarrille. His last cabin still remains they say unless I didn't hear right and it's a replica. They have a portrait of him in Weakley County Courthouse. Cool huh? See When History Fails, Legend Prevails: Questioning the Evidence of Claims of the Masonic Affiliation of Daniel Boone and Davy Crockett (Autumn House 2014) or http://www.thecraftsman.org/resting-on-our-laurels/ You may be quite surprised at how flimsy the past evidence is that has been used to claim either man was a Freemason. My Mother is a D.A.R. !! We put together a book about one-inch thick that documents her Motgers direct bloodline to Crockett. Our family owns the property where Crocketts cabin was. What was left of his last cabin was donated to the town Of Rutherford, in Gibson county. The salvagable beams have my Great, Great Uncles name on them. Hamp Taylor, it was rebuilt and is now a Crockett museum. My Grandmother lived on that same land that is now used for cattle grazing. There is a family burial plot where my Mother will be buried, there is also a slave burial plot on the same land which is now about 1500 acres. There are also two portraits in the capitol in Nashville, also last name Taylor that were Governers. The same bloodline goes directly to Scottland. I often fell people that I come from a long line of drunken Indian fighters. Of one doubts what I say go visit the cabin in Rutherford. Crockett came from the East TN area and slowly made his way west. The family is still very proud that Crockett told DC "ya'll can go to hell, I'm going to Texas!" What’s on Your Masonic Christmas Wish List?